All done! We'll get back to you soon. 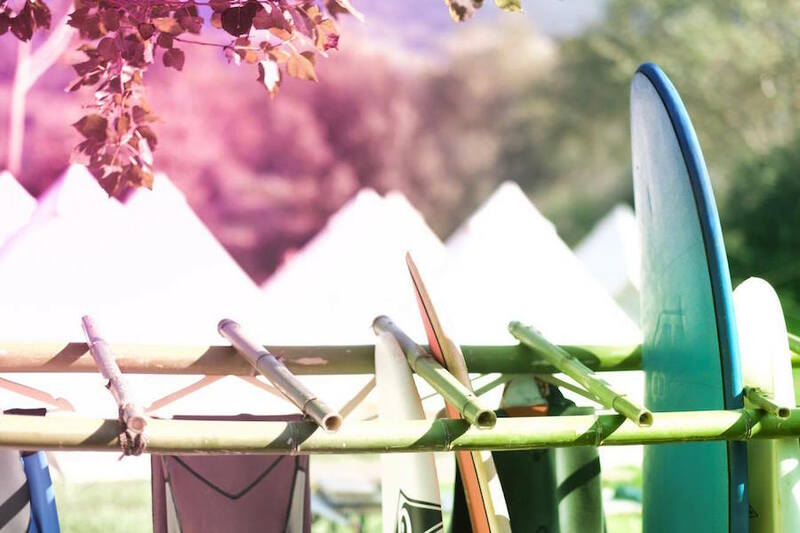 Situated in the heart of Oyambre Natural Park, our surf camp is pitched among the gorgeous rolling hills of Cantabria and offers you an exciting week of surfing, Yoga, SUP, beach cruiser trips, beach volleyball and many other fun outdoor activities. On top of that, Spain’s north coast has stunning beaches, perfect waves and breathtaking landscapes, all just a stone’s throw away from our great surf camp! Located close to Santander, fly to us from all across Europe, hop on a ferry from Plymouth or Portsmouth or make it a road trip with direct routes over land. We can’t wait to show you and your friends this special little paradise this summer! 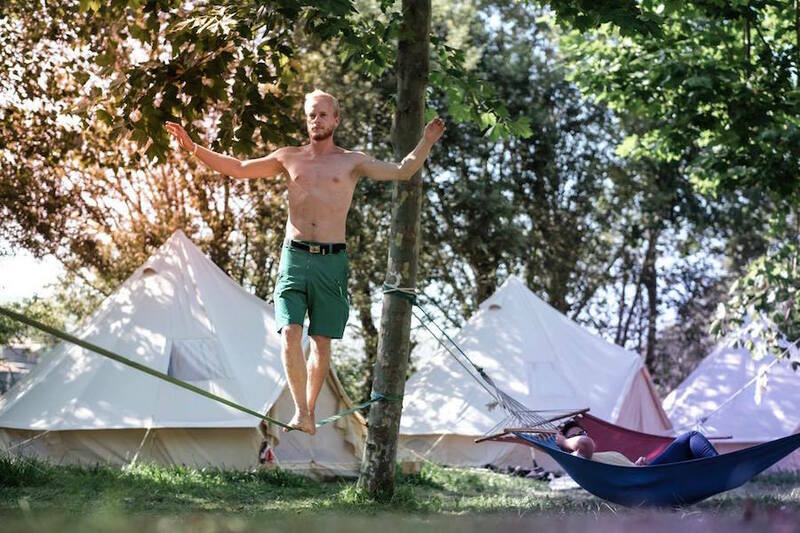 Access to camp equipment, such as balance boards, skate- & longboards, beach games etc. 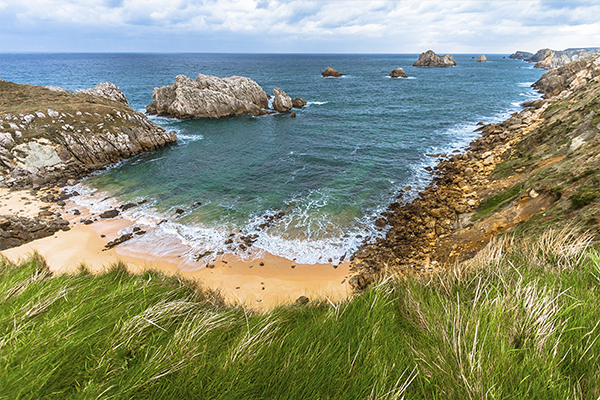 Where the water’s a little bluer, the sun a little brighter, the people a little friendlier and the clocks go a little slower than elsewhere in the world, you’re in Cantabria, the beautiful North of Spain. Located in the heart of Oyambre Natural Park, a nature reserve, is our activity surf camp. 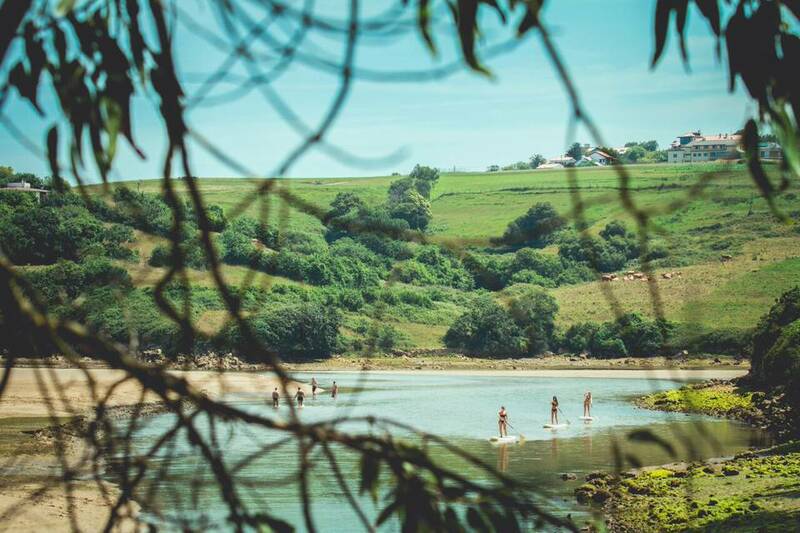 Here, you’re spending your surf camp holidays learning to surf, practising all-level Yoga in our surf camp or on the beach, and on exciting Stand Up Paddle adventures exploring the beautiful coast of the Bay of Biscay. During the summer months, the northern Spanish coastline offers great wave conditions for surf beginners and intermediate surfers alike. It is the wider Santander area, inclusive of Playa de Oyambre, the beach break just a few minutes walk from our surf camp, that is hit by consistent summer swells that carry gentle rolling waves ideal for first-time surfers and everyone wanting to improve their existing surf skills. 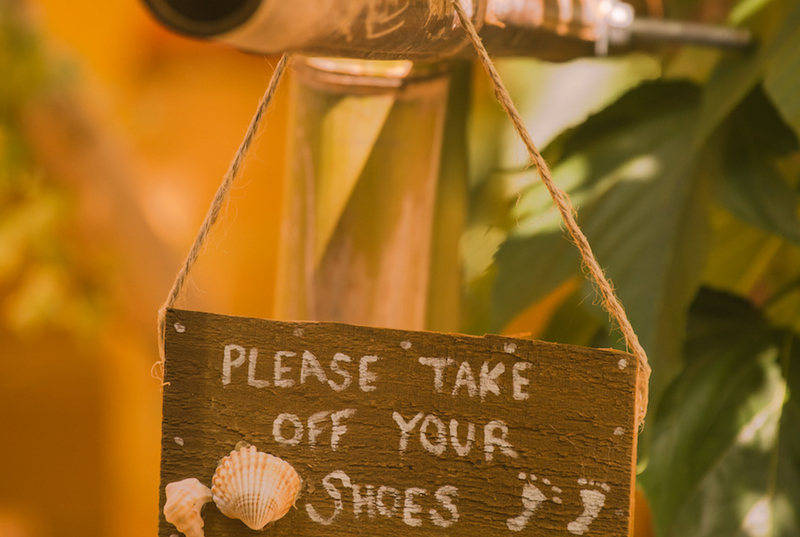 Facilities in our activity surf camp include a spacious yoga deck, large eating and entertainment as well as chill-out and hammock areas, a sports court, ping-pong table, balance trainers and a swimming pool. Our surf camp team lives on-site and looks forward to welcoming you for a week of adventures, relaxation, great fun and new experiences. Oyambre is a great place to learn to surf! If the waves have a little swell, we teach surfing and if the sea is calm and clear, we grab the SUP boards for a day exploring the ocean and improving our balance and core strength. Renowned for a fun, professional and enthusiastic approach to teaching surfing, our international Star Surf Camps’ surf instructor team helps you catch the best waves while in the water with you. Per surf holiday week, you receive 12 hours of surf coaching. This includes lots of time surfing the gentle waves of Playa de Oyambre, the beach just outside the surf camp, as well as a theory surf session in the camp, teaching you about water safety, rip currents and the intricacies of Spanish beach breaks. The maximum group size is eight surfers per one to two instructors. All surf equipment, surfboards, leashes and wetsuits, is free to use within the lesson and free upon availability outside of them. 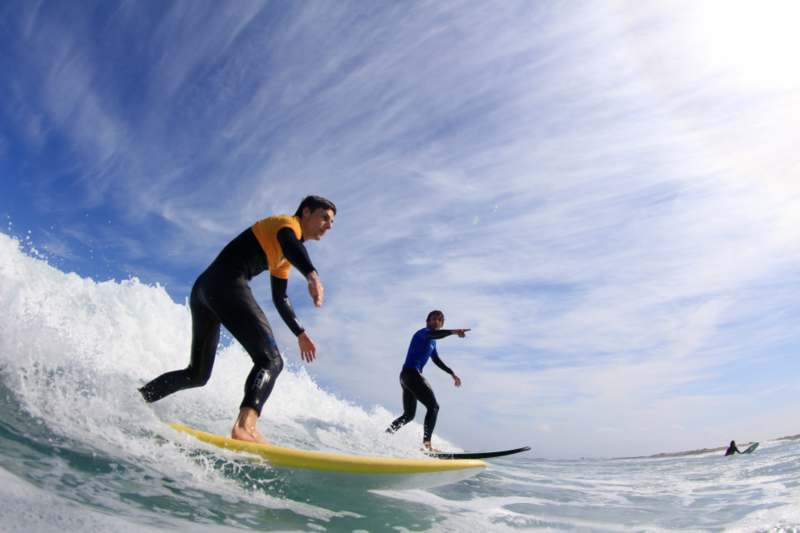 All our surf instructors are experienced, fully licensed and qualified, and also have a lifeguard qualification. You would like to spend more time in the water, further improving your surfing technique? When booking your surf camp holidays, you can add on extra surf lessons with our Surf & Relax Upgrade which includes four hours of additional surf tuition with our surf team. Suited for both beginners and intermediate surfers, our surf lesson upgrade allows for more time in the water with your surf instructor to further improve your surfing skills. 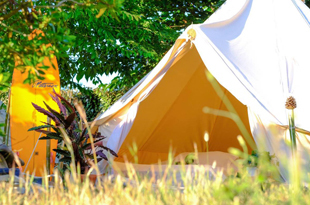 Our standard accommodation in our Oyambre surf camp are large 8-man bell or tipi tents. But, fear not, you are only sharing them with a maximum of two others surf camp guests. 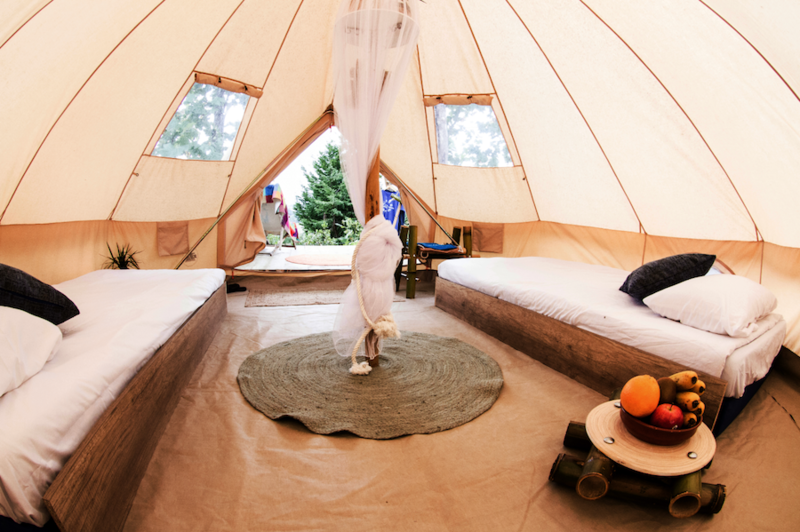 The tents are tall enough to stand a surfboard in and wide enough for some morning yoga stretches. A good night’s sleep is key when spending your day outside and in the water. That’s why we provide you with a high quality memory foam mattresses when on surf holidays with us. All our mattresses are allergy free, high density and super comfy. All you need to bring along on your surf trip are a pillow, sleeping bag or bedding. If you’d like some more privacy when on surfing holidays in our Oyambre surf camp, you have the option to upgrade to a private tent for just you and your bestie or significant other during the booking process. 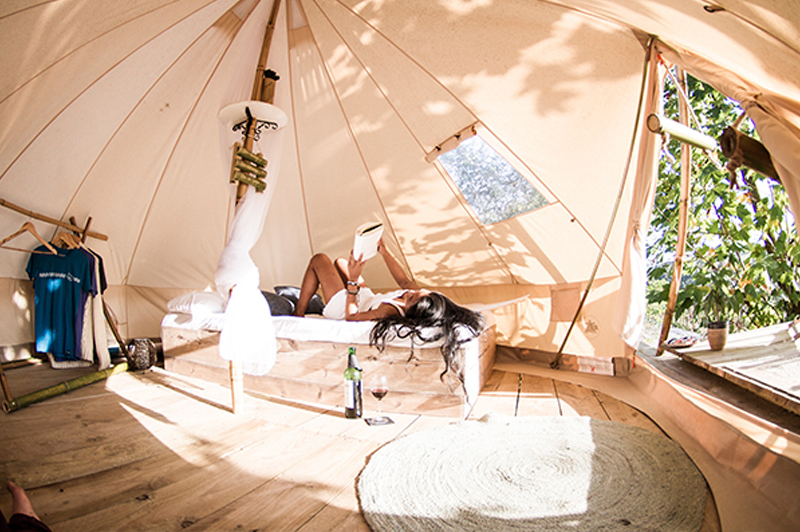 Our private tents (35€/PAX/week in low season; 50€/PAX/week in high season) are the same spacious 8-man tipi tents and come with our high quality mattresses, either as two singles or one double. And should you wish to travel lighter when coming on surf holidays to our surf camp in Oyambre, you can rent bedding for 25€/Pax/week. 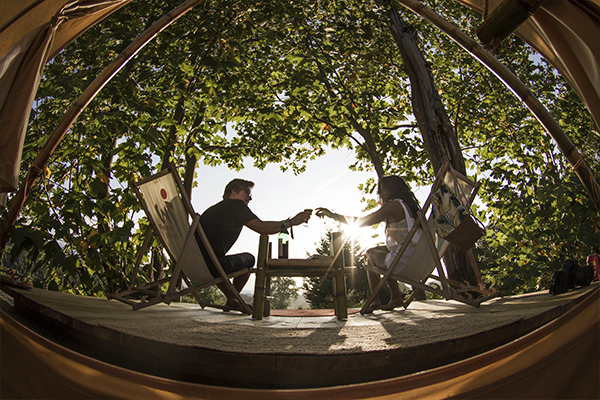 Set in the more secluded part of our surf camp is our beautiful deluxe accommodation. 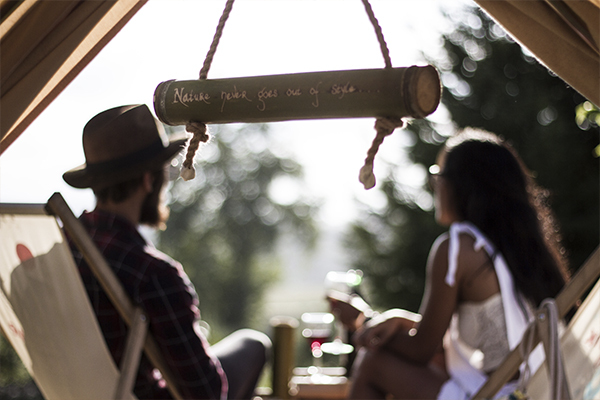 With raised, wooden beds, bespoke decoration, electricity and lighting, these beautiful bohemian-style tents provide a very comfortable surf camp home away from home. Here, you’re sleeping on the latest surf camp memory foam mattresses which are high in density, allergy free and very comfortable. Our deluxe tents are for 2 surf holiday guests and equipped with either two single or one double mattress. All you have to bring is your pillow, bedding or sleeping bag. But should you wish to travel lighter when coming on surf holidays to our surf camp in Oyambre, you can also rent bedding for 25€/Pax/week. Revitalize Your Mind With Yoga! Yoga has swept surfers all over the world off their feet with all professional surfers using it to help improve their flexibility, core strength and surfing performance. So, if after a long day surfing you feel like you could do with some stretching, Yoga is a fantastic way to improve your flexibility and to strengthen your body. New to our Oyambre surf camp this year are our Surf Yoga Sessions, included in all our surf camp packages. For those of you who’ve never done Yoga before, your group session will be a fun and informal introduction to Yoga. For all experienced Yogis, your group session will focus upon how Yoga compliments your surfing. Our most popular surf camp packages in Santander include 3 Yoga sessions per week, and our enthusiastic and professional Yoga instructors make their sessions fun and accessible to ‘Yogis’ of all levels. So come along and join us for an inspiring sunset course and see the positive effects of Yoga for yourself, your body and your surfing! You want to know who teaches our Yoga sessions in our Santander surf camp? Meet our lovely Yoga instructor Holly here! Our Delicious Spanish Surf Camp Cuisine! Every day, we provide you with a breakfast buffet that includes a variation of tea, coffee, juices, milk, cereals, honey, jam, fresh bread, cakes, cheese, ham, salami and fresh fruit as well as with a picnic lunch for your day out surfing or SUPing. 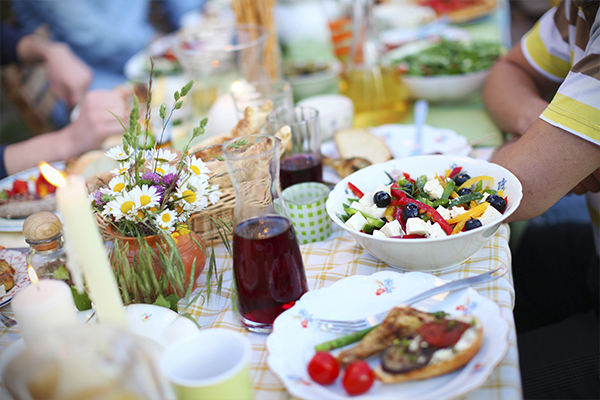 On four nights of the week, our on-site chef prepares a fresh and delicious dinner for you that we all enjoy together. And on a fifth evening, we invite you to join our traditional Wine & Cheese night which is one of our surf camp week highlights. We also have an on-site snack shack with ice creams, chocolate bars and other smaller snacks and treats. Please note that we do not serve breakfasts on Saturdays due to early departures and late arrivals on change-over days. Thank you. We have vegetarian and vegan options available upon request. And if you have any allergies or other dietary requirements, please let us know in advance. Please note that we do not serve breakfast on Saturdays due to the early arrival and departure of some guests. Thank you. Our relaxed and social entertainment schedule in Oyambre is suited to all ages and adjustable to the weather and your preferences! 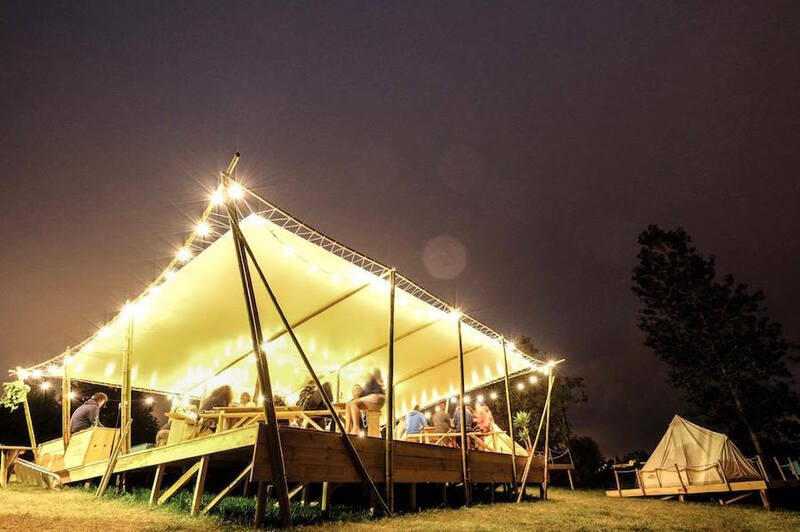 Our surf camp in Oyambre near Santander is made up of our beautiful, spacious tipi tents, a shaded seating area for entertaining and eating, an outdoor cinema area, a large chill-out zone with sun loungers and hammocks, a big Yoga tent, plus storage, surf and SUP equipment tents. We’ve also got a volleyball court, table tennis and balance trainers, skate- and longboards, beach cruisers, a variety of beach games, and we also provide you with surf, SUP, Yoga and exercise equipment all free to use! Our surf camp is part of a larger campsite which also hosts other holiday makers. It is equipped with several bathroom and shower facilities as well as sinks and mirrors that are available 24/7. This campsite also includes a pool area, a basketball court, a bar and a Café with WiFi. Next to surfing and SUPing, some of our weekly highlights are our sunset Yoga sessions on the beach, a bike trip to the gorgeous and historic town of Comillas, a day of beach games, our delicious wine, cheese and tapas session, a BBQ, a volleyball tournament, surf theory lessons and a surf movie night, a sunset session on the beach with music and drinks and many, many other fantastic opportunities for you to relax or mix and mingle. On top of that, there’s plenty more to do in and outside the camp. 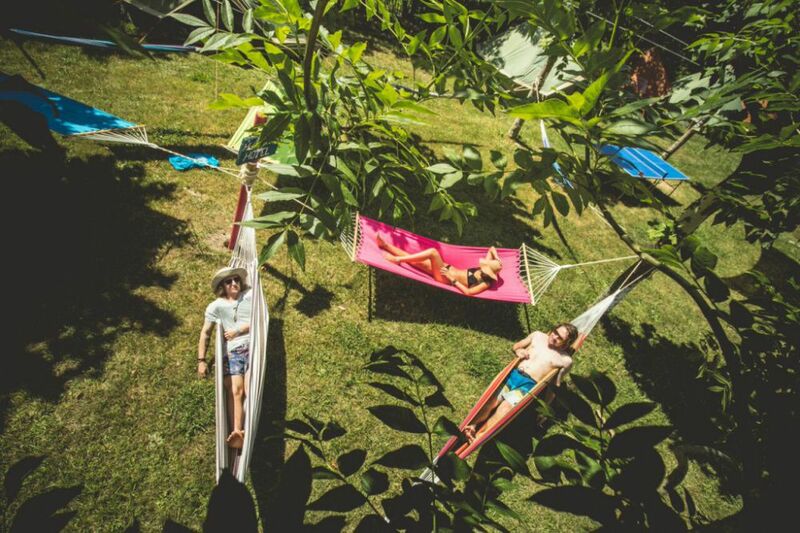 Relax and read that book that’s been sitting on your shelf for months in our comfortable hammocks and sun loungers, try our outdoor balance trainers and brand new skate- and longboards, or use one of our lovely beach cruisers for a trip along the trails of Oyambre Natural Park. Join Us on a Coastal Adventure! With no age or ability limitations, how about you join us in venturing out along the beautiful coast of the Bay of Biscay, admiring the marine life as you glide over the turquoise waters? And if you’re on a tight schedule and can’t join our groups, we’re flexible and happy to arrange a private trip that suits your time and needs. Or you want to make SUPing your own little adventure? Also no problem, equipment rental is included in the price of your stay so grab a board, grab a paddle and go explore! We highly recommend to go for a sunset paddle for the ultimate relaxing end of your day in the sun. Explore & Discover the Oyambre Area! 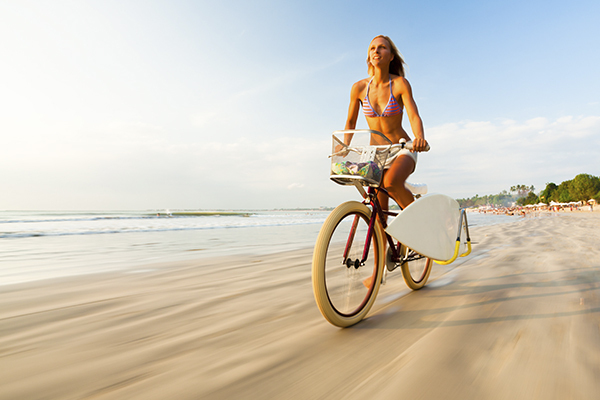 Grab one of our brand new beach cruisers to explore the beautiful landscape around our surf camp. Oyambre Natural Park has great bike trails in all directions with stunning panoramic views! And with several little towns close by, those of you joining us without a car can get to shops and restaurants in no time. Bliss! Our activity surf camp is located in Oyambre Natural Park on the North coast of Cantabria, Spain, just west of Comillas and close to Santander. Located in the North of Spain, the picturesque town of Comillas is situated among the beautiful green hills of Cantabria. Nestling between the majestic mountain range of the Picos de Europa and the azure lagoons of the Bay of Biscay, the village derives its authentic Spanish charm from its historic sites, striking architecture, delicious eateries and delightful local shops. On entering Comillas, the city enchants its visitors with a rustic harbour, red cobbled streets and a lively centre with traditional Cantabrian shops and restaurants. We come here to indulge in some delicious Spanish tapas, to saunter through one of the charming handcrafted jewellery or clothes shops or to visit one of the little art galleries or museums. Named an important cultural, historic and artistic centre, follow us along Comillas’ little cobblestoned roads up to Antoni Gaudí’s stunning Villa Quijano – better known among locals as “El Capricho”, the whim. In true Gaudí fashion, the former summer residence of Don Máximo Díaz de Quijano is showered with colour and has a cylindrical look-out point covered in ceramic sunflower tiles which makes the vivid building unique and a sight not to be missed. Comillas’ most impressive and arguably most beautiful landmark towers over the charming village in the West: The former Pontifical University is an extraordinary architectural construction and, from our point of view, most striking when lit in the evening. 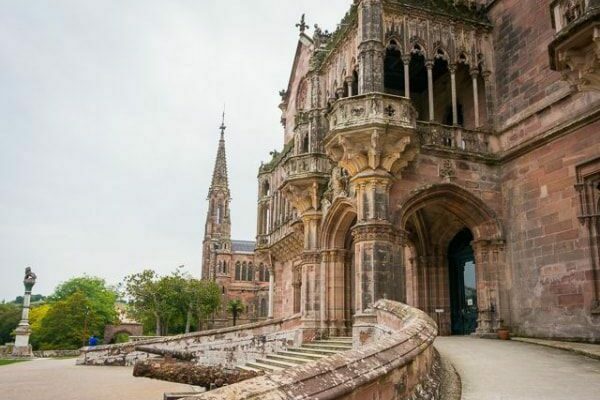 Comillas’ magnificent location, fascinating history and enchanting atmosphere make our trip here a weekly highlight and, surely, an adventure not to be missed! Curious? Here’s more about Comillas. More to See & Do! Spain’s oldest national park, the Picos de Europa, with its three impressive limestone massif is within driving distance and will certainly leave you speechless. Depending on the weather and our surf holiday guests’ likings, we arrange day trips for our surf camp to go to the Picos de Europa for a day out hiking, climbing and relaxing in the thermal springs! 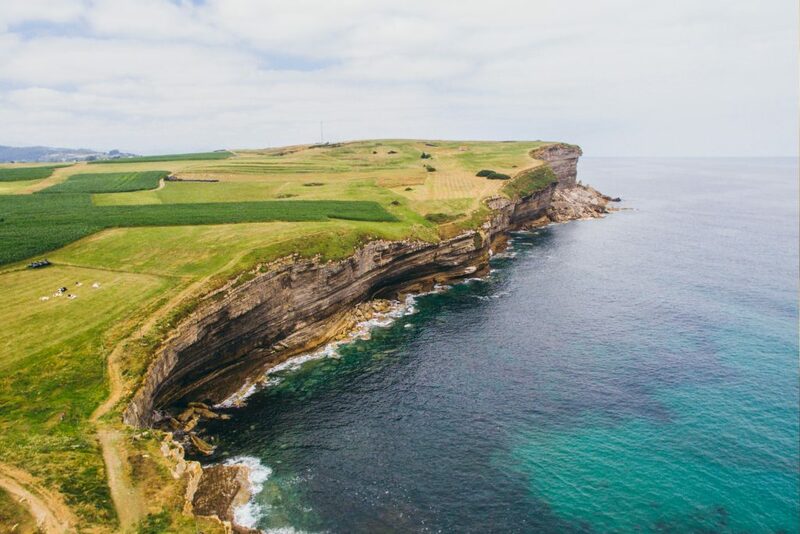 For the golfers among us, there’s a nine-hole golf course right outside our surf camp overlooking the Cantabria’s coastline. Having a car in this area can be an advantage if, for example, you’d like to see the stunning coastal town of San Vicente de la Barquera with lots of shops, authentic restaurants and a lovely little harbour for you to explore and other close-by villages. Located close to Santander, you can fly to us from all across Europe or hop on a ferry from Plymouth or Portsmouth! We run daily shuttles on Saturdays from Bilbao airport (35€ one-way) via Santander airport (25€ one-way) to our surf camp and vice versa. Please note that times might vary each surf camp week as we try to adjust our weekly surf camp shuttle schedule to accommodate all surf holiday guests’ arrival and departure times as best as we can. We offer extra days in our Santander surf camp as some of the ferries arrive/depart on Friday and/or Sunday. Contact one of our surf travel experts to find out more. To make sure your surf holidays in Santander run as smoothly as they possibly could, here’s a list of a few things you shouldn’t forget. Should you forget your bedding or sleeping bag on your surf holidays to Oyambre, don’t worry! You can borrow bedding for just 25€ per surf holiday week! Our Star Surf Camps office team is based in Plymouth, England and speaks English, German, French, Spanish and Italian. 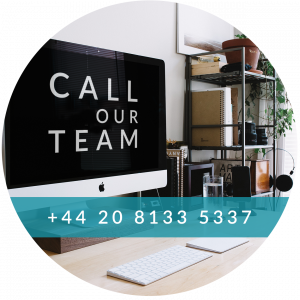 If you have questions about one of our surf holiday destinations or surf camp packages, you can pick up the phone to call or WhatsApp us, send us a message on our live chat, Facebook messenger or email. Is the Oyambre surf camp the right one for me? The surf camp is right for you if you want to have an active surfing holiday, try out different sports and, afterwards, relax in a peaceful surrounding. Our surf camp packages include surf lessons and Stand Up Paddle lessons, additionally we have beach cruisers, practise yoga, play beach volleyball and more. The surf camp generally has a very cosy and relaxed atmosphere with a yoga deck, sun loungers and hammocks. Do I need to have Yoga experience to participate in your Yoga sessions? Prior knowledge of Yoga is not required to participate in our Yoga sessions. Our qualified instructors make their Yoga sessions accessible to beginners as well as to experienced Yogis. We also provide all Yoga equipment free for you to use during lessons. What is the best way to get to the surf camp? There are many ways to get to our surf camp in Oyambre. Most budget airlines fly to Santander from all across Europe. If you're coming from the UK, take the ferry from Plymouth or Portsmouth to Santander. If you’re not planning on renting a car or driving yourself, check out our car sharing Facebook page for more options. I want to travel light and don't bring a sleeping bag. Is that ok? Of course! Should you forget your bedding or sleeping bag or just generally don't want to worry about carrying it all, don't worry! We provide you with a memory foam mattress and you can also borrow bedding for just 25€ per surf holiday week. Is your surf camp international? Star Surf Camps are the leading international surf holiday company. In our surf camps, we don't just introduce our surf holiday guests to the sport and lifestyle of surfing, but provide multinational and multicultural spaces for people from different nationalities, background ​​and cultures to get together. All our surf camp staff speak English and Spanish, are DBS checked and have experience in working with young adults. What sets Star Surf Camps apart from other surf holiday providers? At Star Surf Camps, we are renowned for our fun and enthusiastic approach to teaching surfing. We only use quality equipment and work with professional surf instructors. Outside the water, we provide age-appropriate entertainment in a safe environment. We provide high quality accommodation and facilities as well as a varied and healthy diet. I have a food allergy. Do you cater for me? Of course! We have vegetarian and vegan options available upon request. And if you have any allergies or other dietary requirements, please just let us know during the booking process. Thanks! Is the camp family friendly? Yes, it is. We offer camp activities that are suited to kids of all ages. And with a swimming pool and lots of free beach games, there's plenty to do in and outsite the campsite. Considering our surf and SUP lessons, we always try to accommodate our families by providing special family surf and SUP lessons.